For anyone who has never set foot in a courtroom or dealt with a significant legal problem, law is a mysterious profession. Television dramas paint solicitors as in-control and aggressive Type-A personalities who have the world by the tail. Most people may not consider a solicitor’s office as a worrying place to work, but the legal business is among the top five most stressful jobs in the UK. Solicitors and other legal professionals face a variety of demands that lead to anxiety and even depression. 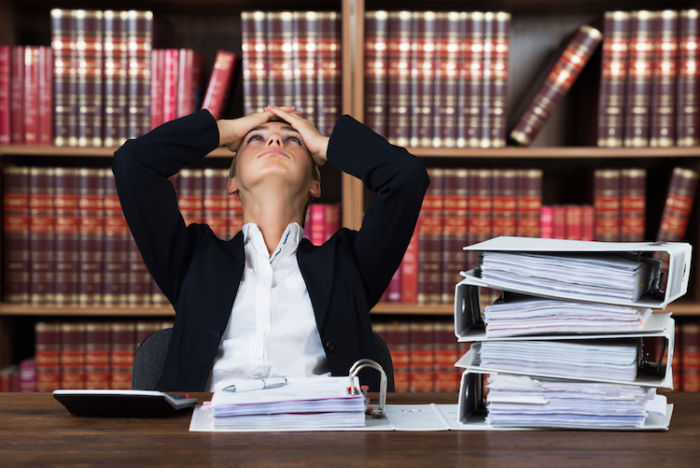 A wide-range of stressors and circumstances contribute to a lawyer’s anxiety level. While stress takes a heavy toll on younger professionals, its effects are not limited to just newly qualified solicitors. Everyone in a law firm faces similar challenges and difficulties that can elevate anxieties and make the profession one of the toughest in the nation. Long Hours - Most solicitors put in a full week of work and often work on the weekend. Depending on the area of practice, it may often be necessary for a lawyer to be on-call out-of-hours. Emergency petitions, hearings, and sudden changes during a case lead to extended hours of research, brief writing, and preparation. For solicitors in criminal defence practice, calls may come in the middle of the night. When clients are in a crisis, they may not be considerate of their lawyer’s personal time. A full schedule combined with erratic extended hours can be a considerable source of stress and anxiety for any solicitor. Deadlines - The law functions on a defined set of rules and time-schedules, but the system rarely runs as smoothly as the rules dictate. Hearings that run late, the strict necessity for timely pleadings to be filed, and even opposing party tactics can turn deadlines into nightmares. Solicitors must frequently adjust to changing positions, schedules, and unexpected rulings. Having to be prepared for any situation can lead to increased anxiety for even the most prepared lawyer. Client and Billing Demands - A solicitor’s clients may face complex legal questions that can have life-altering effects, especially in cases focused on criminal defence. One wrong decision by a lawyer can lead to imprisonment, fines, loss of assets, and other serious consequences for the client. For many solicitors, leaving that pressure at the office is an impossibility. In addition to facing difficult client issues, most solicitors also contend with internal pressures of the job. Supervising lawyers, partners, and firm rules may impose billing demands on every solicitor. The need to increase income and profits can be an overwhelming factor that pushes even the best lawyer to the edge. In a highly competitive field, finding a comfortable fit with the right firm or practice can aid in reducing a solicitor’s stress levels. Improving location may also contribute to stress management; solicitors that are more comfortable and enjoy their surroundings may have an easier time letting go of anxiety that builds in the office. The professionals at Symphony Legal know that solicitors face incredible pressure and stress. Our understanding and knowledgeable career specialists can help lawyers and other legal professionals discover their best-suited opportunities to reduce stress and improve personal success.